Often called the eighth wonder of the world, Ngorongoro Crater is the largest unbroken caldera in the world, and is one of the only places in Africa you can view every member of the “big five” (rhinoceros, lion, cheetah, leopard, elephant and buffalo) on a single game drive. Long ago Ngorongoro Crater was an active volcano but its cone collapsed, forming the crater that is 610 meters deep, 20 kilometers in diameter, and covers an area of 311 sq. km. Unique to Ngorongoro, indigenous tribes are permitted to live in the conservation area and local Maasai graze their livestock on the crater floor in harmony with nearby herds of buffalo and wildebeest. The crater is home to many species of wild game and birds. With the exception of impala and topi and the giraffe, almost every species of African plains mammal lives in the crater, including the endangered black rhino, and the densest population of predators in Africa. A strange thing is that the crater elephants are mainly bulls. The bird-life, which includes the flamingo, is mainly seasonal, and is also affected by the ratio of soda to fresh water in Lake Magadi on the crater floor. On the crater floor, grassland blends into swamps, lakes, rivers, woodland and mountains. You can descend to the floor of the crater in a four-wheel drive vehicle. Most of the animals reside year round in the crater so anytime of the year is good to visit. 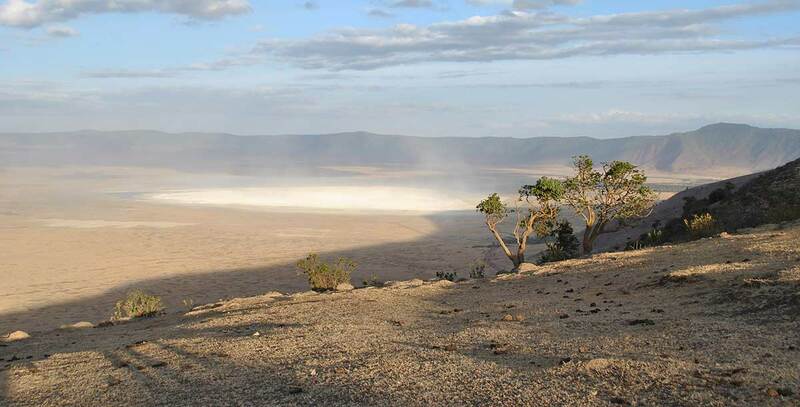 It is not possible to stay inside the crater at night but there is a campsite and some wonderful lodges on the crater rim which offer some spectacular views of the crater below. This destination is not to be missed. If time is short, it can be accomplished as a day trip from Moshi or Arusha.